In times past, a blue rose was an expression signifying the impossible, the unattainable, something that exists in fantasy alone, not in nature. Perhaps it can still be said that blue roses do not exist in nature. Once, white roses were dyed blue; now, blue roses can be produced thanks to genetic engineering. In spite of this, blue roses continue to hold their old meaning. As a result of their "main" meaning, blue roses signify romantic feelings, love at first sight, and hope that things that seem unattainable at first (like love with a particular person, or prosperity in the future) are indeed attainable. This is an optimistic spin but remains part of the message that the flower can be used to send. 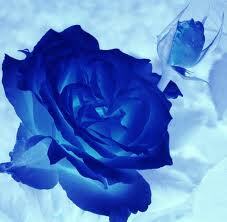 Of course, a person may use "a blue rose" to describe something extremely rare or normally impossible.